Since being diagnosed with a rare form of cancer when she was only 8, Sarah Cook has dedicated most of her young life to helping kids and teenagers treated at the Montreal Children’s Hospital on the ward that bears her name. The many projects supported by Sarah’s Fund since 2001 have had an immeasurable impact on our young hematology-oncology patients. 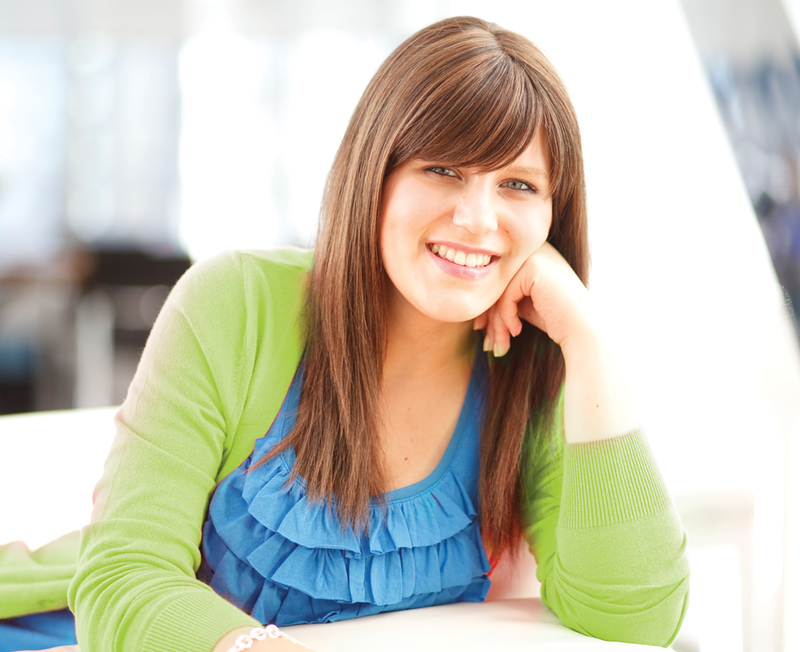 We honour Sarah Cook and her Dream to help other children battling life-threatening illness. 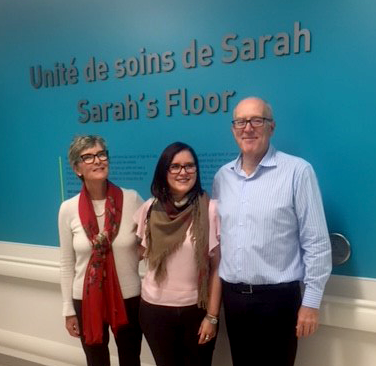 Sarah’s Fund is dedicated to support the needs of the Pediatric Hematology – Oncology patients and their families by providing the best patient care to improve the quality of life for young cancer patients on the Sarah’s floor (7B) at the new Montreal Children’s Hospital. 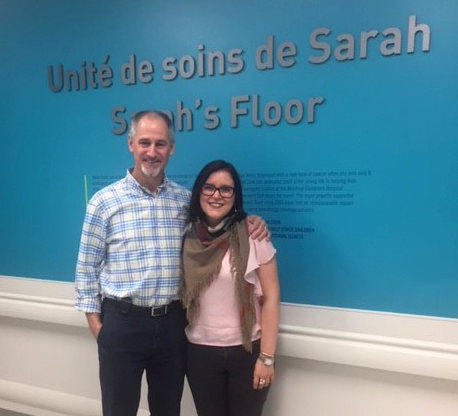 The Sarah’s Fund strives to make a meaningful difference in every child’s life that has been touched by cancer at the Montreal Children’s Hospital at the MUHC. This year marks the 18th year of Sarah’s Fund for Cedars, I am deeply honoured and touched by the continued support we have received from the Montreal community. Never in my wildest dreams did I imagine how successful this event would become. Sarah’s Fund started with a little girl’s dream of buying new pillows and helping other patients and their families, never did I foresee the support we would receive and how much more we could accomplish. With your help, we have been able to provide better facilities for the doctors, nurses, and staff to work in, as well as better treatment for the patients and families on Sarah’s Floor. Sarah’s Fund for Cedars focuses on patient care; with the money raised we help support the many programs that we have brought to the hospital such as pet therapy, music therapy, and continued education for nurses. We have also helped purchase state of the art equipment. We have been able to go above and beyond my original dream and I can’t express how much I am in your debt. When I visit the floor and hear laughter and see smiling faces, I know that we have made a huge difference in patients’ lives. No child or family should have to go through this disease and I hope that one day we do find a cure, but until that day arrives, I want to thank you for the bottom of my heart for supporting Sarah’s Fund for Cedars. You are helping the patients diagnosed now, who are battling now, and I can’t thank you enough. Splash and Dash is one of my family’s favourite events because it’s a day where other families and groups of friends can help raise money and awareness together. It also demonstrates that children and young adults have the capacity to help others their own age. So please, come and enjoy the day on Saturday, November 2, 2019. Bring your family and friends and to come watch our very own heroes from Sarah’s Floor participate because, at Splash and Dash, they are just like any other kids enjoying a day of fun. Faced with illness, our family and close friends began to view life from a different perspective, and with newly focused priorities. We were inspired to look beyond our own challenges to fully appreciate the pressing needs of the Hematology/Oncology Division of The Montreal Children’s Hospital and their young patients and families. As a tribute to our daughter, and in support of the efforts of the professionals who make a positive difference in the lives of hundreds of children and their families every year, we founded the Sarah Cook Fund of the Cedars Cancer Foundation for Children. Through our special events, personal and corporate funding as well as donations from local communities and friends, the Fund has raised over $12 million. The most touching gifts have come from children who know Sarah, using their birthday parties, lemonade stands, puppet shows, races and events to raise donations for Sarah’s cause. We have always supported Cedars Cancer Foundation’s excellent work towards improving cancer treatment in Montreal, and are pleased to be affiliated with their long-standing volunteer effort in conjunction with The Montreal Children’s Hospital Foundation. As we look to the future, our medical advisory board continues to suggest projects within the Hematology/Oncology Division that urgently need funding.